It's a Girl Thing Sudden Shadows Phrases wall decals are fun by themselves or are great as accents to Sudden Shadows giant wall decals. Add a touch of girly lingo to all sorts of themes... princess, gymnastics, drama, girly-girl, and more. 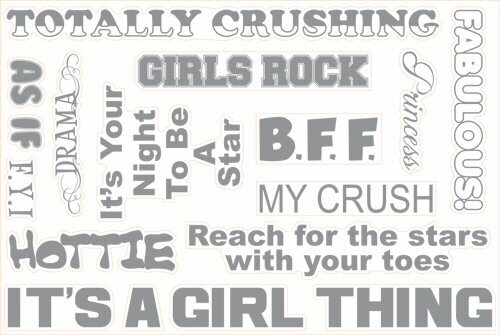 Perfect to blend with any color, these peel and stick wall sticker phrases apply easily to the wall and will delight the girls in your life for years to come. These It's a Girl Thing Sudden Shadows peel and stick wall decals are amazing semi-transparent wall stickers that creates a shadow-like appearance over any paint color or mild texture. Easy to use, reposition, and remove, It's a Girl Thing Sudden Shadows giant wall decals will not damage your wall or leave any sticky residue behind. 5.25" x 2.5" to 39" x 3.5"